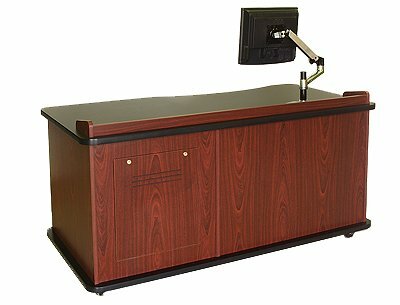 SCM-640L Desks are a flexible platform for integrated systems in classrooms. Standard construction includes rack rail, rear access, a heavy duty drop leaf, and a locking pocket door. There is no charge for machining the top surface to take control panels or for changing a left/right orientation. 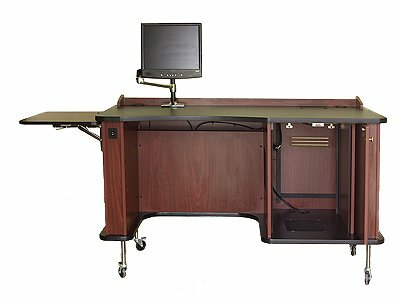 These 640L desks use our super-quiet, hydraulic height adjust to achieve ADA compliance. Casters or glides are no charge options. Many finish combinations are available. The desk shown is in Mahogany Melamine with black trim and a black high-pressure laminate top. The monitor is mounted on an optional Ergotron mount. Full 10-Year warranty.